Prime Minister – and supposed Indigenous Affairs Prime Minister – Tony Abbott has insulted First Australians, saying Australia was "unsettled" before British colonisation, while his Indigenous advisor Warren Mundine laughed off the calumny. First Australian Natalie Cromb comments. This, of course, is the same Tony Abbott who, in the lead up to last year's election, told a large group at Arnhem land that he would spend his first week as Prime Minister with the Yolngu People. When it was pointed out by David Donovan in late September that he had not, actually, done that, PM Abbott was backed to the hilt by his hand-picked Indigenous advisor, Warren Mundine, who excoriated IA's managing editor for foolishly taking Tony at his word. So, who is this Mundine? And why has he thrown his support behind a prime minister whose attitude towards Indigenous Australia is ambivalent at best and downright duplicitous at worst? As a proud member of Australia's First Peoples, I would like to talk about Warren Mundine and his relationship and connection to Indigenous Australia, as well as lay out what a person in his position should aim to achieve. Warren Mundine is an accomplished man with a large family and extensive political history with the Australian Labor Party — however, those closest to Mundine do consider his political aspirations self-serving rather than for the greater good of the Aboriginal people. Lending weight to this critique is the fact that he has jumped ship from Labor, citing he was “sick at heart” following the appointment of Bob Carr to the position that he was courting and now he is Prime Minister Abbott’s key advisor on Aboriginal Affairs. I am sure that Warren Mundine’s ‘leadership’ status and ‘advisor’ capacity has nothing to do with the fact that he shares the same religious philosophy as the Prime Minister, is an economic conservative that supports Abbott’s policies of individual economic participation as being of more importance than the empowerment of communities and he appears to tow the party line. Warren Mundine’s views are widely criticised and rightly so. He has supported a political party and policies that have set Indigenous people back, and makes outlandish comments of this nature, which not only deny the history of this nation, but belittle it for an economic cause. An example is the recent announcement of $42m funding being cut from the National Aboriginal and Torres Strait Islander Legal Service (ATSILS). The ATSILS is the one organisation that attempts to counterbalance the obvious discrimination that occurs in the criminal justice system. It is accepted as fact, and there is a tremendous amount of data to support, the contention that Indigenous Australians are racially profiled and are more likely to receive custodial sentences than their non-Indigenous counterparts for the same crime. Nevertheless, ATSILS is staring down the barrel of a crippling funding cut. Mundine did little to oppose this cut and, in fact, said Indigenous programmes should be looking for further "efficiencies". In my opinion, Mundine and Abbott can expel rhetoric about efficiencies until the cows come home but a cut is a cut and cuts of this magnitude, targeted in such a manner, illustrate a complete disconnect between Abbott, his adviser and the Aboriginal populace at large. The real issues faced by the Aboriginal communities all over Australia – noting that the issues are different for many of the community groups – have not been considered in any meaningful way and it is the duty of the Indigenous Affairs advisor to stop defending "great bloke" Abbott, and the Government he leads, and start advocating forcefully for the Indigenous people he is meant to represent. I do not have a problem with Warren Mundine as a person, I have a problem with what he represents. What he represents is the patriarchal manner in which political parties in Australia approach the issue of Indigenous Affairs. It is not acceptable for political parties to appoint a token representative to address the issue, misrepresent to the community they are going to be acting in the best interests of the community and then fail to consult the community upon which they are imposing laws and policies. Has the Bringing Them Home report been forgotten completely? Have we lost the essence of that the Indigenous culture is all about? Community consultation and involvement is paramount! The patriarchal “for the good of them” attitude is Aboriginal protectionist policy continued into the modern day. For as long as Indigenous policy is approached in this manner, it will fail. It is apparent from the actions of the government that their priorities are all about governmental budget savings rather than effecting any real change to the consciousness of Australians that might lead us all to a more inclusive nation. Aboriginal people are not a ‘problem’ to be solved by the Liberal party for the cheapest means possible, so the economic conservatives can give each other a pat on the back. This government, and all governments that seek to enact laws in this manner, need a history lesson. A truthful history lesson. The crux of the matter is that European people settled on land belonging to the Indigenous inhabitants under the falsehood of terra nullius and, thereafter, the settlers imposed English law upon the Indigenous inhabitants, including laws which sought to disperse them from the lands to which they belonged on a spiritual level, and further to diminish and/or destroy the families and culture with which they identified. 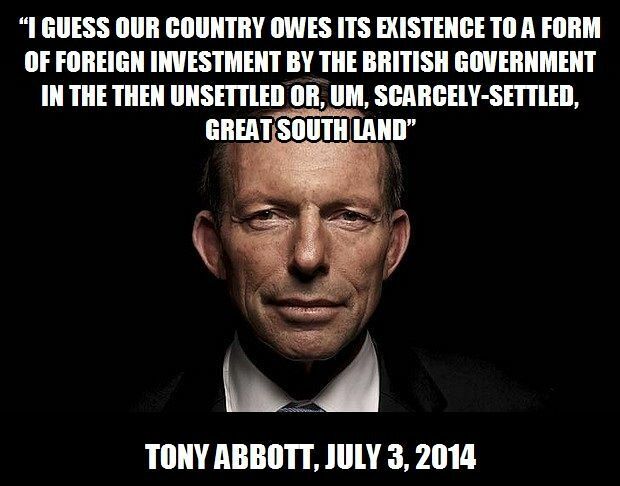 This history, however bleak and embarrassing to Australians – and Tony Abbott – is what actually did occur. Australia needs a leader and a government that will look at the history of this nation and utilise this history as a lesson in tolerance and how to be more appreciative of a culture that owned and cared for this land for at least 40,000 years before European settlement occurred. This nation needs leaders that understand the racial divide of this nation and how to go about correcting and bridging this divide. There are two key and pressing ways in which to make the first steps to effect dramatic change that will bridge this divide. The first is education and the second is a treaty. Currently, there is very little education as to the true history of this nation and the events that occurred upon settlement, which is why Abbott was able to get away with his abhorrent and ignorant remarks yesterday, receiving almost no media response. And unless one seeks out that education, the majority of Australians have nothing but negative mass media produced stereotypes about the First Peoples, which breeds malevolent disregard towards Indigenous Australians. Thus, it was Warren Mundine's job to rebut Abbott's comments today, not downplay them and call them "silly". Moreover, the act of creating a treaty between Indigenous and non-Indigenous Australia would provide not only a basis upon which future relations could be established, but it will create a legacy for future generations to look upon with pride. Whilst the history of this nation is turbulent, it does not have to be looked upon with shame forever. Australia can become a nation proud of its rich cultural history and all that it entails by enacting a treaty which effectively conciliates the issues of contention between Indigenous and non-Indigenous Australians. Australia should be a proud nation without one culture having to compromise its entire identity. The Prime Minister has stated he has passion for Indigenous Affairs – and while that claims seems dubious – Warren Mundine should be holding him to his word and advocating for Aboriginal Australians. Let me be clear: we do not need leaders that arbitrarily state Aboriginal people need to forgive because it is in keeping with their own personal beliefs, stemming from a European religious institution that has committed countless horrors against Indigenous people. That would be about as palatable to Indigenous people as asking victims of sexual predators to forgive their assailants. What we need are leaders – whichever party they are affiliated with – to stand up to the policy status quo and fight the hard fight for the Indigenous people of this nation. Most particularly, our Indigenous leaders need to fight for a change to curriculum in schools to educate future generations on the accurate history of this nation, so that future generations of Indigenous children do not suffer the ridicule of previous. It is the duty of our Indigenous leaders to be effective communicators. We cannot rest until our perspective is understood and empathised with, because only then will there be policies enacted that are culturally appropriate and in line with community needs. If you are the man for this, Warren Mundine, then I urge you to stop being a spokesperson for the Liberal party and start being an advocate for your people.